If you’re trying to avoid harmful chemicals in your beauty products, this homemade glycerin lotion recipe is the solution to many of your problems! Glycerin is an all-natural moisturizer for all skin types, making it the perfect ingredient for this homemade lotion recipe. Reading the ingredient list on a bottle of commercial lotion is scary! Our skin is our largest organ, and it deserves as much care as anything else. Actually, many studies suggest it needs even more attention than some of our other body systems. Our digestive system can at least partially break down chemicals and toxins that we ingest orally. But substances that enter through our skin enter directly into our bloodstream. This means it’s super important to make sure that everything we put on our body is as safe, healthy and beneficial as what we put in our body. What’s In Face and Body Lotion? But when it comes to skin and beauty products, most of what you’re going to find on store shelves contain harmful additives and preservatives. These include parabens, phthalates and synthetic fragrances, to name a few. In fact, even seemingly harmless ingredients can cause problems. For example, you’ll probably notice that water (aqua) is one of the number one ingredients in most conventional face and body lotions. Seems harmless, doesn’t it? But the presence of water means that there are likely preservatives added in order to keep the lotion from growing mold. So, what’s the solution to ridding your skin and beauty products of harmful ingredients? Make your own glycerin lotion! Glycerin is an organic compound derived from plants and animals. Animal glycerin comes from animal fats (like lard and tallow) and is typically used in bar soaps. 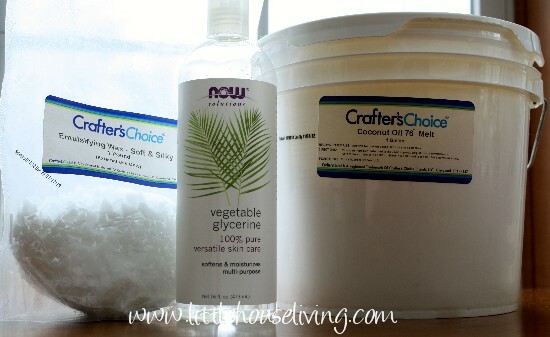 Vegetable glycerin is made from vegetable oils like soy, palm, coconut and corn oils and is typically used in liquid cleansers and lotions like the glycerin lotion recipe I’m about to share with you. Glycerin is a humectant, which means it’s very effective at drawing in, retaining and preserving moisture. It’s also an emollient, which means it provides a protective, moisturizing layer on the skin. The combination of these two things makes glycerin an extremely effective skin moisturizer. Glycerin also has a naturally long shelf life, which means you don’t need to add preservatives. And it doesn’t oxidize easily (which means exposure to air and light will not damage it). It takes just minutes to learn how to make homemade lotion and this glycerin lotion recipe has just four ingredients. It will moisturize and soothe even the driest winter skin, and a little bit goes a very long way! You can even customize it with your favorite essential oils. Some good essential oils for skincare include lavender (soothing), frankincense (healing and restorative), and chamomile (calming). This lotion is even suitable for babies! My daughter has a patch of eczema on her cheek, and this lotion is the only thing that helps it. I love knowing exactly what I’m putting on my baby’s delicate skin. * It’s important to use distilled water instead of regular tap water in this recipe because distilled water is less likely to mold and more likely to give your lotion a longer shelf-life. Keep this lotion in the refrigerator when it’s really warm to keep the coconut oil from liquifying and to help prevent possible mold and degradation. 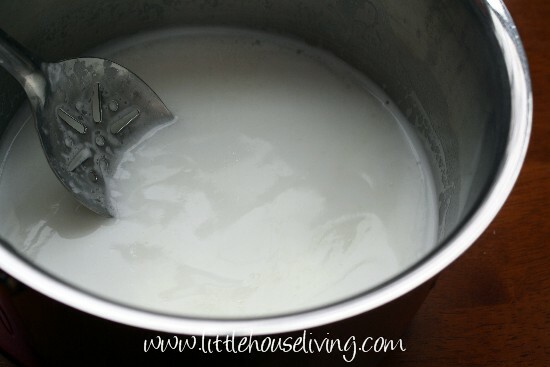 Combine the coconut oil and the emulsifying wax in a double boiler on the stove (or in a microwave-safe bowl if you prefer) and heat until melted. Add the distilled water, glycerin, and essential oils if using. Stir thoroughly. Pour into the desired jar(s) or bottle(s). (I divide mine up into a few 4-ounce mason jars, then store the rest in a bigger jar in the refrigerator). Use daily in place of store-bought lotion to help moisturize dry skin! 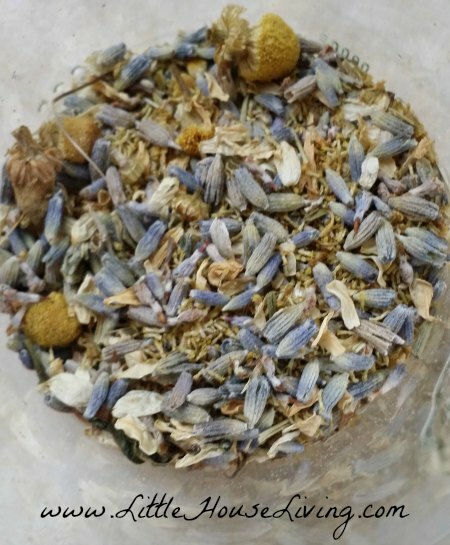 Looking for more super easy homemade beauty products? 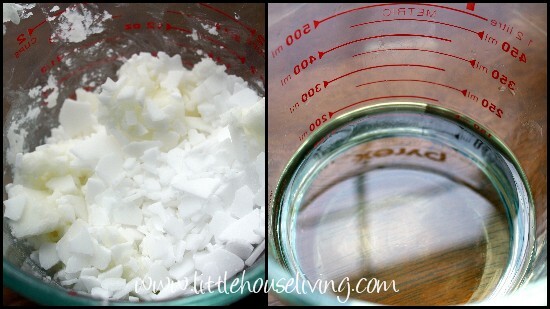 Check out our Coconut Oil Lotion and find a bunch more DIY Health and Beauty Projects here on Little House Living! 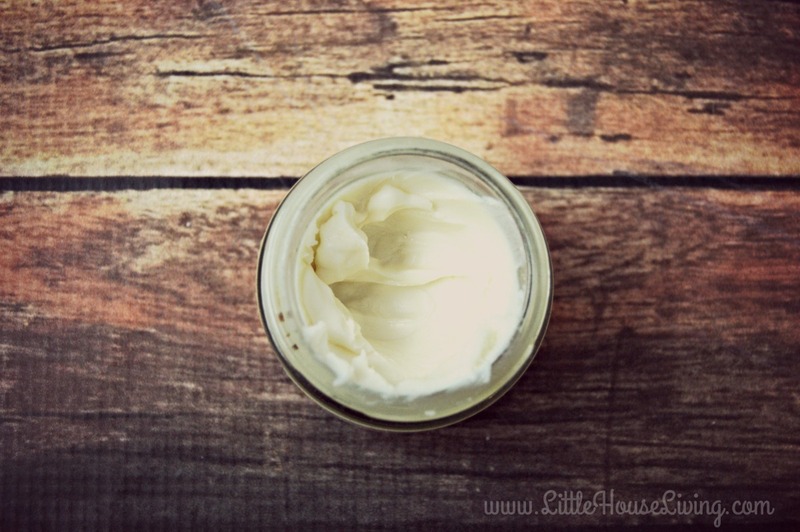 Did you know how to make homemade lotion before today? What else would you like to learn how to make at home? Let me know in the comments below! 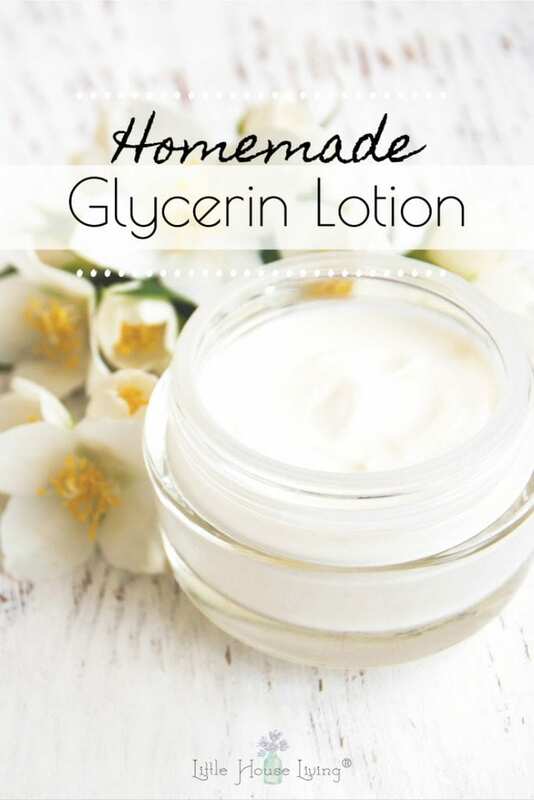 This Homemade Glycerin Lotion Recipe was originally published on Little House Living in March 2013. It has been updated as of February 2019. I’ve noticed that distilled water is called for here and in other recipes for body products such as soap. Do you know why? What will happen if I use tap water? Distilled water is free of bacteria and minerals that could interfere with the shelf life of a homemade product that does not have preservatives. You technically can use tap water, but I would boil it first to ensure it is sterile. also tap water contains all sorts of icky add ins like Chlorine and other chemicals that alter the pH of the water and change how it behaves when mixed with other things- so it may really ruin your lotion. Even bottled water contains all these contaminants. Go to any bottled water brand’s website and look at their water report- you will be shocked. While distilled water is literally just H2o. This is why it behaves differently when poured. I sandwich both hot & cold waterlines with ceramic magnets negative charges using a quality hiking compass until I get a hold of neodymium. It is makes the water cleaner from MANY impurities that was discussed in your comment & replies. I never specifically tested it, but the smell & taste of chlorine left from my virginia apartment in 15 days with ceramic magnets. Neodymium is far stronger though. It is not a true filter, but loosens things up. Nonferrous metals would still get through, but have a different state due to magnetism. Since the ceramics are much weaker you could double or triple the magnets on each side to get better results faster. You could also just gradually do whatever you afford with this. My folks do not like magnets on the waterline, but they do like the flavor changes & they are not even on city water. You can also make it easier by just using the Coconut Oil as your lotion/moisturizer. I have very dry skin and use exclusively Coconut Oil as my moisturizer all over my body. Not only does it moisturize but I have noticed a decrease in my fine lines and elasticity of my skin. Just remember that a little goes a LONG way!! Sometimes I use just coconut oil, too! It really is amazing. It can be a little oily for me, though, so I like to have it lotion form as well. Also, I find that combining it with the wax helps to lock in the moisture. Can you use beeswax for this? I have all the ingredients at hand, except I have beeswax, which I use successfully in other recipes. Thanks! Beeswax isn’t an emulsifier, so no, it wouldn’t work 🙁 E-wax is the only way to go. beeswax is not an emulsifier.It will just be greasy but is good for rich hand lotion and lip balm and lotion bars.If you want a Real lotion like you buy at a store than e wax is the way to go! I just made my own lotion and it looks like I bought it from a shop! I’m impressed!Emulsifier changes everything!? If all the tools and jars used are sterile, and the lotion is kept in a cool climate or in the fridge, then it will not mold that quickly. Dipping dirty or wet hands into the jar or using non-sterile equipment will cause it to spoil, though. My lotion keeps for months with no preservative, though I do add lavender essential oil which could help hinder spoilage. If you use a presertive how much should add per recipe? katydidsoaps is correct, it needs to be emulsifying wax. 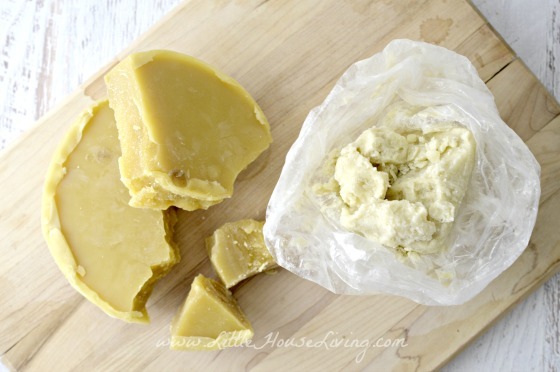 Beeswax is a thickener, and though it might hold the lotion together for a little while, it will eventually separate. I really like Wholesalesuppliesplus.com. They have great prices on bulk products, and free shipping on orders over $30. Amazon is awesome, too. I made a lotion that called for glycerine and I found that the lotion felt sticky on my hands. Anyone else experience this with glyverine? I haven’t tried this recipe yet, and am hesitant because of the glycerine. Thank you, I hope you like it! I buy my essential oils mostly from Amazon, but also Mountain Rose Herb(really good organic oils) and WholesaleSuppliesPlus.com. I compare prices between the three and go with the best deal. I found some “essential oils” sold on Amazon are not pure EOs but rather a few drops of EO in an ounce of carrier oil. Shame on them for labelling as pure EO. Just read the fine print. Mountain Rose is high quality, usually or g panic. Where do u buy the wax and the glycerin to make this lotion? The wax, glycerin, and coconut oil sources are linked in the ingredients list above. This is a great recipe. I have been looking for lotion recipe for a while. I just pinned this. We have a link party called Wednesdays Adorned From Above Blog Hop and would love to have you share this and any other posts with everyone. It runs from Tuesday night through midnight Sunday. We also have a $50.00 Visa Gift Card Giveaway. Here is the link to the party. I have never heard of making your own lotion before. I’ve been in a soap making class, but never lotion. I really love this idea. It’s so rewarding to make your own stuff!! I know our readers would love to see this, too! Our Weekly All Things Thursday Link Up party is going on now at allthingswithpurpose.com, and we would LOVE for you to join us 🙂 Hope to see you soon!! I can’t wait to try this lotion, just love homemade lotions and creams. Thank you so much for sharing this awesome recipe with Full Plate Thursday and have a great weekend! Well, after doing a little more research, I guess all or most (haven’t found one that says it doesn’t) emulsifying waxes contain polysorbates and even the possibilities of other ‘nasties.’ I’m kinda bummed. Not sure if this is a route I want to travel when I’ve stayed so far away from anything carcinogenic in my bath and body products. Please delete the above comment tho’ and this one as well so as to not cause confusion. This is another of those things we each have to figure out for ourselves… I like your blog very much and will have to wander around and do some reading! Thank you! Can you use fragrance oils as opposed to essential oils? I don’t see why not, but honestly, I have never worked with fragrance oils so I cannot say for sure. Yes, you can, but a few drops go a LONG way. Use sparingly. I was looking into making a caffeine lotion… What do you think the result would be if I used coffee/espresso instead of part of the water in this recipe? That is really interesting! I have never tried anything like before, so I’m not sure. I don’t see why it wouldn’t work, though. Maybe try making half a batch first to see how it turns out. I’m going to give this a try! Thank you! I have been making my own organic lotion for quite sometime now, as well as shampoo, deodorant, lip balm etc… Most recently a few people have wanted to carry some of my products in their stores. My concern is the shelf life of these products being as there are no preservatives. Do you have any recommendations? Ooh, that’s tough. Products that contain water are more likely to go bad quickly, especially in warm weather or with less than ideal conditions (multiple people sticking dirty hands into a container of lotion). I personally have had my preservative-free lotion, which IS made with water, last a month or more at room temperature, longer in the winter. My lip balm lasts many months without going bad, and it does not contain water. So I suppose it depends on the composition of your products, and if they could possibly be stored in refrigeration at the store. When in doubt, make the expiration date on the products earlier rather later. Good luck! It lasts months and months. I’ve had my jar last over 4 months. Is this recipe measured out by weight or volume? Thank you for the nice recipe – I am testing out various things and make my own facial moisturizers and lotions, but I have really dry skin and I love coconut oil so it’ll be interesting to make a cream that is this simple – I plan to drop glycerin down to 10% from 20% and see if that makes a less sticky lotion to begin with. Just a note to those worrying about e-wax. I am a chemist by education, and E-wax can describe several different things, but e-wax NF normally contains Cetearyl Alcohol, Polysorbate 60, PEG-150 Stearate and Steareth-20, or some similar combo thereof. None of these have been implicated in anything remotely carcinogenic, and all of these are typically vegetable-oil derived (vegetable oil hydrogenates and the like). Please don’t worry about it, and ignore the sources which spread panic for no good reason. Not everything with a ‘chemical’ sounding name is bad – all the natural oils can be written in scary-sounding ways, but calling it ‘caprylic triglyceride’ or some such doesn’t make coconut oil any less wonderful for you! I love your site!! But reading through the natural lotion ingrdiedie is glyceri eand that is on my allergy doctors list of top ten offenders. Is there a substitute? I made this a while ago and it only solidified halfway through. I put it in the fridge and still did not solidify. I followed the instructions exactly so I am not sure what I could be doing wrong. Would it be okay to use less water? Yes I would try using less water and see if that helps. It shouldn’t separate. Where all the correct ingredients added and in the correct order? Try heating it up again. Sometimes the temperature isn’t quite right and just needs heated up again to mix completely. You can even add a little more e wax if you’d like to be sure. You can use this lotion over your body. Either plastic or glass should be fine, just make sure it’s stored in a cool dark place. You can simply wash any tools in warm soapy water in advance. Is this thin enough to put in a lotion pump container? Thanks! Yes, this lotion is the right consistency to use in a lotion pump container. What is the purpose of the glycerin in this recipe? I have never put it in my homemade lotions. We have a recipe for how to make an alternative to Petroleum Jelly here. I have made body butters before and no problem , but I choose this to be my first lotion and it didn’t come out right. I checked four times to make sure I used everything called for and only the top formed a creamy form. all the rest stayed liquid it sat over night and still didn’t come out a creamy lotion. Is there something I can do so all of my money isn’t waisted.??????? I hope you can help. My final lotion separated like Candy and Ashley’s – liquid and cream separation. What do I need to do to blend the layers? I really want it to work. Help please. Did you use emulsifying wax? I put all in a bowl, melted it all a bit, with the water in it, then mix it all with a hand mixer. All blended together. However, it turned out more like a butter. I was hoping to make a more liquidy cream. Whatever suggestions you have to make the cream more like a lotion rather than a cream is welcomed. Hmm, I think I would whip in a little more glycerin and see if that makes the difference. Let me know! Patchouli EO is excellent for helping heal psoriasis. I also like to infuse my oil with calendula petals for additional healing properties. Shea butter can crystallize – a friend told me once the melted butters & oils reach 170 degrees, leave it on the heat for 20 minutes. No more problems with crystals. Keep in mind peppermint EO can be a skin irritant, so use with care in delicate areas. Could you use a combination of Aloe Vera gel and glycerin in the lotion recipe? Yes, I think that would work great! I do make sure to keep anything with aloe vera in a cool dark place. Is there a special type of pot/pan I should use when making this kind of stuff? What do you prefer? Thank you! You said the recipe is measured by volume, but that doesn’t seem like much wax. Should the wax be measured by weight? Can you adjust the coconut oil to glycerin ratio a bit? You have 4.5/8 ounces for oil/glycerin. Could you do more like a 6/6 ratio? What about a little less water to make it thicker? Maybe even a little less water? Maybe 12 ounces? Glycerin helps seal moisture into skin. It also helps to make the lotion a nice consistency. Hi there!! I was wondering if I can use Aloe Vera water instead of distilled water? I’ve had a problem with the coconut oil and glycerine separating. Has anyone else? Any advice? Thank you so much for this great recipe! I am looking forward to making my own lotion, it is something that I have put off for a while and just done body butters but I would like something that is less thick and heavy! I was a little concerned about the emulsifying wax and glycerin being “natural” enough to meet my small body care companies needs. After reading this (all your links are to great brands) and doing a little more research I feel a great deal better and will try this recipe soon! Thanks for such a great blog, I can’t wait to read more. This lotion turned out well, though I did need to increase the amount of emulsifying wax and oil. My main concern is that I just started reading about the risks of homemade lotion made with water if one doesn’t use a preservative. (And those preservatives aren’t easy to come by; you have to buy them from a specialty store.) A website said that homemade lotions only last 3 days out of the fridge and 1 week in the fridge. I halved this recipe and it still turned out to be a huge amount, way more than I can use in a short time. So I wasted a ton of nice ingredients to make a vast amount of lotion that I can’t possibly use in a week. Any suggestions to preserve shelf life? I’m scared to use it after a while and thinking I should stick to cosmetics without water from now on. My suggestion is to cut this recipe way down, making just a tiny quantity at a time. I recently bought a product named “Glycerine and Rose water lotion”, and I was told I could mix it with my body cream for better outcome. I just wanna know if its safe and advisable to do it.